In 1934 William Gray & Company of West Hartlepool, built the Tattershall Castle for the London and North Eastern Railway Company (LNER), that was later amalgamated into British Rail. Built specifically for use as a passenger ferry on the River Humber, operating between Hull and New Holland, she was launched on 24th September 1934 by Miss Pamela Wilson, daughter of Sir Murrough Wilson, Chairman of LNER. 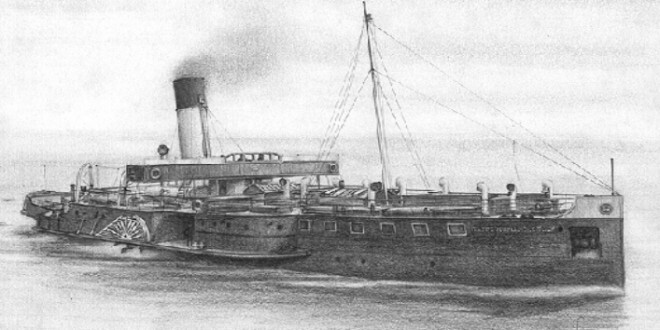 The Tattershall Castle was licensed to carry 1050 passengers, as well as provision to carry a limited amount of vehicles, livestock and cargo. At a length of 209ft (63.3m) and a gross tonnage of 556 tonnes, she was powered by a triple expansion diagonal reciprocating steam engine, and would normally do the four mile journey eight times a day. 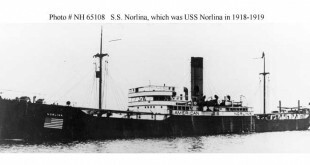 She was one of three sister ships – the Tattershall Castle, the Wingfield Castle and the later Lincoln Castle – all working the New Holland route and, remarkably, all of which have survived the breakers yard. 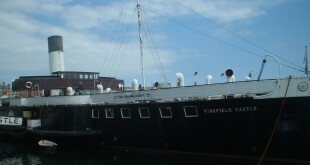 The Wingfield Castle is now berthed in Hartlepool, and the Lincoln Castle at Grimsby. In their early years the two sisters and the paddler ‘Killingholme’ worked the Hull to New Holland ferry crossing along with a Sunday excursion schedule from Hull, comprising evening cruises to Read’s Island and daytime trips to Grimsby. On the outbreak of the Second World War the Killingholme was used to tether barrage balloons and the two sisters where used to ferry troops and supplies along the Humber to wherever they were required. Due to the heavy fogs often encountered on this river, she was fitted with radar in 1948, becoming one of the first civilian ships to have this facility. On one occasion she discovered a ‘stray’ gas float that had broken its moorings and become a danger to shipping. The float was towed to Hull, handed over to the Humber Conservancy Board authorities, and the crew received a £50 reward for their prompt action. Once hostilities ceased the peacetime routine was re-instated with the Lincoln Castle having replaced the Killingholme. Excursions continued for some years but as popularity waned they were finally withdrawn in 1967. Tattershall Castle continued to work the ferry route but in 1973, following 39 years of service, was finally withdrawn as urgent repairs to her boiler were not considered cost effective. Although she was temporarily replaced by another vessel, the subsequent construction of the Humber Road Bridge a few years later would certainly have sealed her fate. Sold to a private individual who was keen to open an art gallery on the River Thames in London, she was soon towed by sea-going tug to her permanent new berth. The Lord Mayor of London opened ‘London’s first floating Art Gallery and Conference Centre’ on 27th February 1975, and the Tattershall Castle continued in this role until 1981, when falling profits forced her sale. She was purchased by the ‘Chef & Brewer’ group, who immediately sent her down to the River Medway for major repairwork on her hull. During a fraught journey back to her London berth various other repairs had to be undertaken, but she opened for business as a bar and restaurant on 8th August 1982. Nearly two decades later and the Tattershall Castle is still providing a wonderful way of ‘dining out with a difference’ in London.